Alfalfa CAN use all of the nutrients. Established alfalfa fields are available during the growing season. There may not be enough corn acres to utilize all of the nitrogen (N) supplied by manure. Phosphorus based nutrient management plans may limit the amount of manure applied to corn. When can manure be applied to alfalfa? There are three points in time when manure can be applied to alfalfa. Let’s take a look at each of these situations separately. Applying manure in the fall of the terminal alfalfa year has traditionally been a dumping grounds for manure and likely one situation where gross over application of nitrogen (N) occurs. 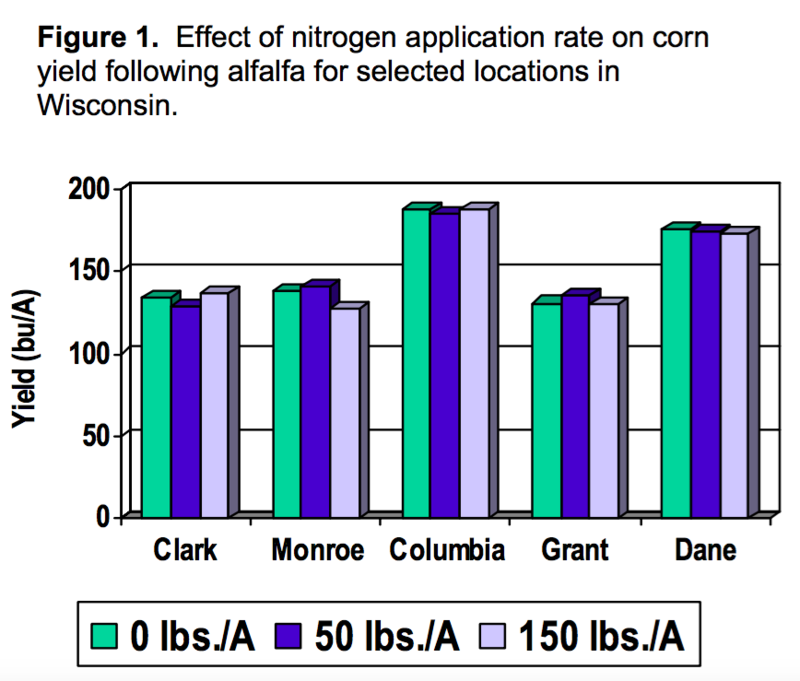 In over 100 site locations around Wisconsin, UW researchers have rarely been able to measure yield responses to additional applied N for corn following alfalfa (Figure 1). There are few instances where a terminal stand of alfalfa won’t supply at least 90 to 120 lbs. of N per acre to a subsequent corn crop. This means another 40 lbs. per acre is needed to meet the N needs of the corn at a 0.05 N:corn price ratio, the equivalent of about 10 tons ofsolid dairy manure or 4000 gallons of liquid dairy manure per acre. In many situations, four or five times this amount of manure is being applied. Over application of manure during this terminal year of alfalfa comes at a cost to both the environment and the profitability of the crop enterprise. Applying manure to alfalfa prior to seeding breaks tradition from the standpoint that manure N is being applied to a legume. However, such an application can result in significant phosphorus (P) and potassium (K) contributions for alfalfa establishment and in subsequent production years. Research trials in Wisconsin and Minnesota suggest applications of 12,000 to 24,000 gallons per acre can be made in the fall (preferable on medium to fine textured soils) or spring prior to seeding (Table 1). Such a management strategy will reduce or eliminate the need for topdressed P and K during the alfalfa production years. 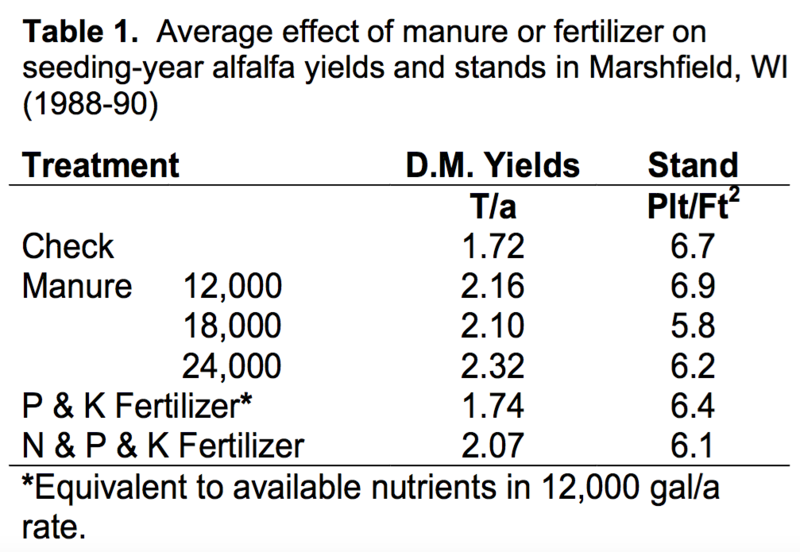 Another interesting result in nearly all of these research trials has been that manure has significantly increased alfalfa yields above and beyond simply major nutrient contributions. In other words, when the same amount of nutrients were applied using commercial fertilizer, yields were not as high as those plots receiving the manure. It’s thought that secondary or micronutrients contained within the manure may be responsible for the yield benefits above that of applied commercial fertilizer. Other factors may include improved soil tilth, earlier N availability, and increased microbial activity. The application of manure to alfalfa prior to seeding should only be used where the crop is direct seeded or the companion crop is removed as forage. Applying high rates of manure where the companion crop is harvested as grain often results in significant lodging of the small grain. Weed infestations from manure applications made pre-seeding have proven to be variable. Research experiences generally show little difference in weed pressure between control and manured plots; however, some producers have noted increased infestations as a result of manure applications prior to alfalfa seeding. Today’s alfalfa weed control options make this less of a factor than was the case 10 years ago. Producers applying manure prior to alfalfa establishment need to make sure to avoid direct contact between the manure and the seed. Broadcast manure must be mixed into the soil and injected manure must be secondarily tilled. A final word of warning is to watch plant tissue K levels where manure is applied at high rates prior to seeding. Luxury consumption of K will occur resulting in high tissue K concentrations. This may cause post-partum metabolic problems (milk fever) in dry cows and springing heifers. Manure salts and free ammonia causing damage to new alfalfa regrowth. Plant crown or shoot damage from wheel tracks. Soil compaction (especially if soils are wet) from manure application equipment. The other potential disadvantage to applying manure on established alfalfa is odor. With no option to work the manure into the soil, public relations with nearby neighbors are sometimes a concern. Make applications immediately after harvest to reduce the risk of plant damage from both salt burn and wheel track damage. UW Research has confirmed that wheel traffic damage to alfalfa is significantly greater after five days of regrowth compared to three. Skip applications if soil are wet. This will reduce soil compaction risks. Target older stands where there is less to lose if plant damage does occur. Additionally, older stands often have more grasses or weeds that contribute to yield and are less prone to damage from manure applications. Don’t apply more than 3000-5000 gallons per acre of liquid manure or about 10 tons of solid dairy manure. Also keep in mind that burn potential is a function of manure ammonium nitrogen and salt content. These vary with manure type and source. Apply manure uniformly across field. Does applying manure on established alfalfa affect palatability or silage quality? There is no evidence to suggest that applying manure to harvested alfalfa fields impacts the palatability of the next crop. Research also suggests that manure applications have a low risk of altering the fermentation qualities of the crop. There is evidence to suggest that in some situations there may be a lower population of naturally occurring lactic acid bacteria. For this reason, it’s advisable to use a silage inoculant containing lactic acid bacteria. For more on this topic, see the Focus on Forage fact sheet titled Silage Quality After Applying Liquid Dairy Manure to Alfalfa Stubble.